Following a successful duo of Junior tournaments, the Global Junior Tag League saw YO-HEY & HAYATA win the trophies at Departure back in August over, The Backbreakers, Hajime Ohara & Hitoshi Kumano. YO-HEY would then go onto call for the reinstatement of the Global Junior League, which happened between September and the 4th of October, YO-HEY would once again reach a final but this time losing to Kotaro Suzuki. Participants for the heavyweight tournament, known as Global League, were announced during this tour. The heavyweights in NOAH this year have been on a tear, producing quality on a regular basis to the backdrop of the generational struggle. Block A features Naomichi Marufuji in his 7th consecutive, 8th overall and a former winner in 2015. Akitoshi Saito, Marufuji’s current tag partner in his 3rd consecutive and 8th overall, Quiet Storm in his 5th in a row, Katsuhiko Nakajima in his 7th consecutive, Kenoh in his 2nd consecutive, winner of last years tournament in his first tournament, can he win two in a row? Masa Kitamiya in his 4th consecutive tournament and Mitsuya Nagai in his 2nd consecutive tournament. Outsider, Kohei Sato from ZERO1 will be participating in his first Global League tournament. Immediately to me, and a couple others on my thread on Twitter, Nakajima vs Marufuji on Day 1 is a match of significant interest, Kenoh vs Marufuji on Day 2 will also be a highlight of Block A action, both days will be in Korakuen Hall on the 30/10 and 08/11. There will also be the clash of Kenoh vs Nakajima, who have been on the same side for the past few months, meet in Osaka on the 17th, and the meeting between THE AGGRESSION, Nakajima and Kitamiya face off in Sendai on the 22/11. People tend to have either Katsuhiko Nakajima or Kenoh reaching the final or winning it, and with both of them in Block A, only one of them can make the final, both are former GHC Heavyweight Champions but only Kenoh has won Global League, the case can be made for either of them to win Block A and then win the final, but Naomichi Marufuji can’t be ruled out either. My personal match up that I’ve dying to see from NOAH is the match taking place on Day 1, 30/10 in Korakuen Hall. Katsuhiko Nakajima and Naomichi Marufuji have been having some very nice looking sequences throughout the year in tag matches that to me have warranted a singles encounter, we’re finally getting it. 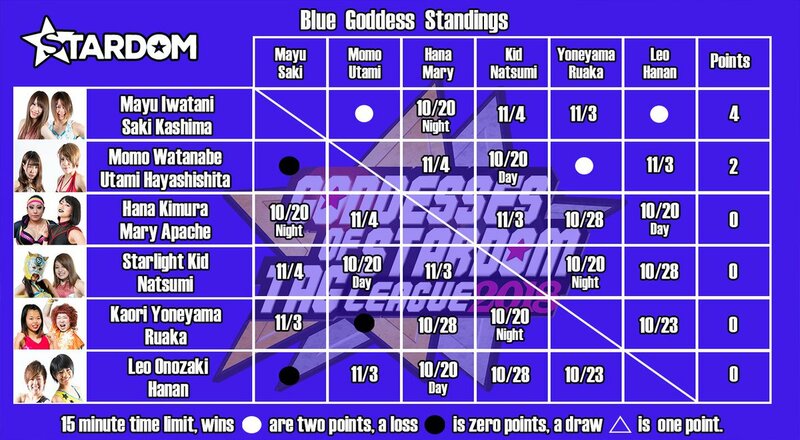 Block B is comprised of Takashi Sugiura in his 8th Global League and winner of Global League 2014, enters as GHC Heavyweight Champion, Mohammed Yone enters his 9th tournament, Go Shiozaki is in his 3rd participation in a row, 5th overall, comedic genius and leader of the Revolution, Atsushi Kotoge is competing in his 2nd consecutive, Kaito Kiyomiya is in his 2nd consecutive and overall, Maybach Taniguchi is in his 7th consecutive and overall with Hooligans teammate Cody Hall in his total and 2nd consecutive. Another outsider, comes in the shape of Dramatic Dream Team hoss, Kazusada Higuchi. I’m looking forward to the story of Takashi Sugiura, who is having a terrific year after coming back from heart surgery and beating all challengers for the belt, no champion has ever won Global League, could this be the year that Sugiura makes history by doing so? He has already won it in 2014, he knows how to go the distance, only Mohammed Yone has wrestled in more Global Leagues than Sugiura in this Block. Sugiura has already named his next challenger should he go onto win the Global League, an act of confidence and determination for me. Matches to look at for this one are the rematch of Takashi Sugiura and Go Shiozaki, who had a cracking match in Kawasaki back in August, the potential comedy match of the year between Yone and Kotoge, Kaito Kiyomiya can have a break out tournament without being pushed too hard, he’s still a bit inexperienced and that could be detrimental to his development. The aforementioned hoss of DDT, Higuchi could be a wildcard player in Block B and I’m looking forward to his involvement, in particular what he does with Sugiura. Takashi Sugiura vs Go Shiozaki is on Day 1, 30/10. Yone vs Kotoge is on Day 2 on the 08/11 and Sugiura vs Higuchi is on the 18/11 in Kyoto KBS Hall. ~ Dragon Gate have added more matches to The Gate of Destiny on the 04/11 in Osaka, MaxiMuM trio of Kaito Ishida, Naruki Doi & Jason Lee will challenge Kzy, Susumu Yokosuka & Genki Horiguchi for the Open the Triangle Gate and RED duo of Big R Shimizu & Takashi Yoshida will take on YAMATO & BxB Hulk for the Open the Twin Gate will join the already announced PAC vs Flamita, Open the Brave Gate match of Bandido challenging Dragon Kid and Ben-K challenging Masato Yoshino for the Open the Dream Gate. ~ This years Super Junior Tag League in NJPW is a single block format with the top two teams advancing to the finals, it will cover thirteen nights and conclude on the main Power Struggle show. Teams are Bushi and Shingo Takagi, Jushin Thunder Liger and Tiger Mask, Kushida and Chris Sabin, ACH and Ryusuke Taguchi, Volador Jr. and Soberano Jr, Sho and Yoh, Taiji Ishimori and Robbie Eagles and finally, Yoshinobu Kanemaru and El Desperado. 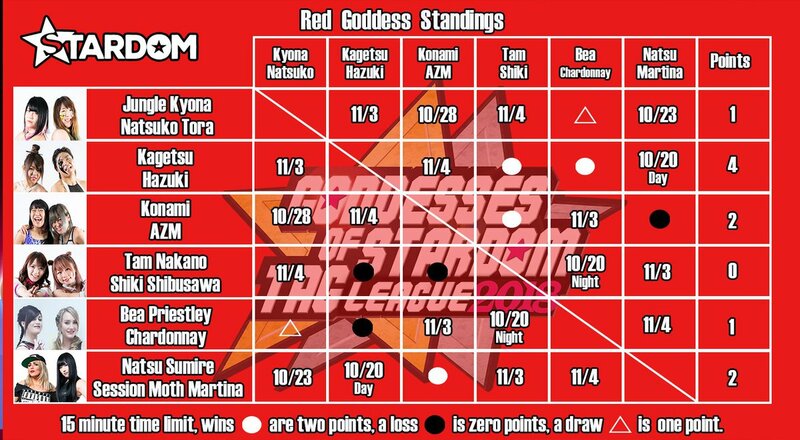 ~ Stardom have started the Goddesses of Stardom Tag Team tournament. Session Moth Martina has joined up with Oedo Tai again and Bea Priestley and Chardonnay are back with Queens Quest.